Home Tags Posts tagged with "flame raisins"
Among other things, Hippocrene Books offers an unparalleled collection of international cookbooks. Sure, the layout is rather dry (no pictures), and the titles aren’t updated very often, but where else can you find a Belarusian or Albanian cookbook? (Amateurish, self-published booklets written by US-based church people don’t count.) Liliana Pavicic’s and Gordana Pirker-Mosher’s The Best of Croatian Cooking is Hippocrene’s entry for — you guessed it — Croatia, and it contains quite a few interesting recipes, many of which could yet provide inspiration for my dormant series of toponymic dishes. The Dalmatian fritters, called fritule in Croatian, are one them. Dalmatia is the southern tip of Croatia, on the eastern coast of the Adriatic Sea. 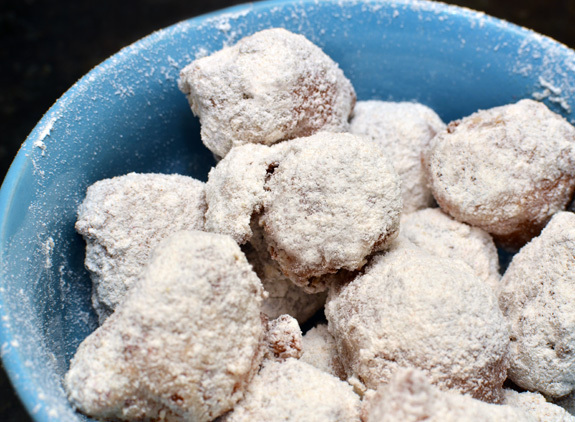 I can’t tell you much on my own about the culinary habits of the Dalmatians, but Liliana Pavicic teaches us that these sweet fritters are made around Christmas time and devoured by children and adults alike. My partner made some for a party and she did get some nice feedback, but I thought there was room for improvement. Make the fritters as airy as possible, as the originals were much too dense to my taste. 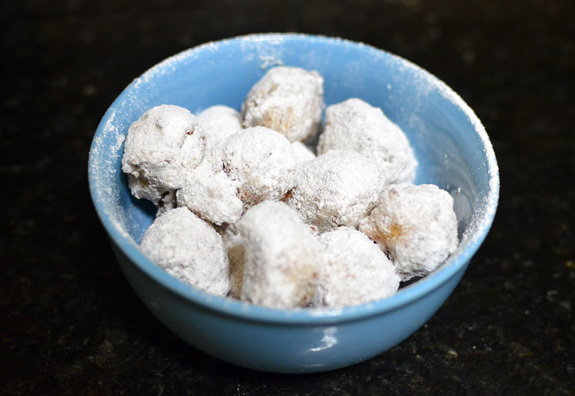 Dessert fritters are very similar to doughnuts, or at least they should be! Add some complexity to the flavor and texture, by mixing apple powder into the confectioner’s sugar coating and using super-plump flame raisins for extra juiciness. The apple powder, made of pulverized freeze-dried apples, can be purchased here. You might be able to achieve a similar result by toasting apple chips in a 200 F oven, then processing them in a blender (I haven’t tried it). Mix the yeast with half of the milk, and let rest for 10 minutes. In the bowl of an electric mixer fit with the paddle attachment, pour half of the flour. Add the yeast mixture and the rest of the milk, and beat on low speed until homogeneous. Mix in the rest of the flour and the eggs, then the sugar, plum brandy, vanilla extract, nutmeg, salt, lemon zest, and flame raisins. Cover the bowl with plastic wrap, and let rest in a warm place for 2 hours. Mix the apple powder with the confectioners sugar, and keep in a sugar shaker, a conical sieve, or a pouch made out of cheesecloth. 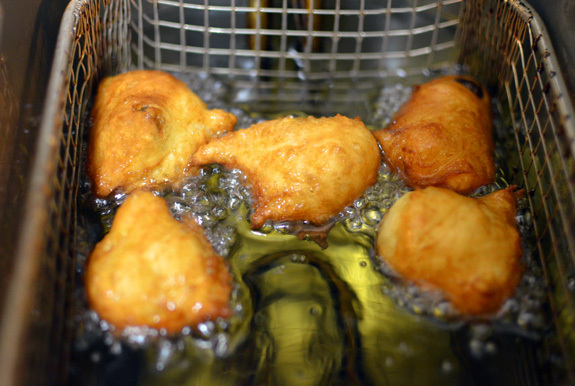 Heat canola oil in a deep-fryer to 375 F. Take a small nugget of dough with a teaspoon, making sure it contains 1 or 2 flame raisins (more if you’re using smaller raisins). Carefully push the dough into the deep-fryer with your finger. Repeat until the fryer is full (don’t overcrowd it, though), and fry until brown on all sides. The fritters float, so you’ll have to flip them with a metal spatula or a spider, or use something to keep them fully submerged. Drain the fritters on paper towels, and let cool for about 2 minute. Transfer to a bowl, and sprinkle generously with the apple-sugar mixture, tossing until all sides are coated. Eat within 30 minutes. If you wait longer, not only are you a person of remarkable willpower, but the fritters will start to get stale and the sugar coating will absorb moisture.